Boston Wants to Harness Composting Energy The city says a multimillion-dollar indoor composting facility would help generate electricity for 1,500 homes. Mayor Tom Menino says the composting center, which would take yard trimmings and discarded food, would help turn Boston from "Beantown to Greentown." 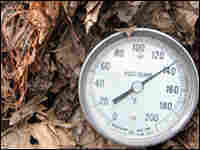 A thermometer in the compost pile shows the temperature near 140 degrees. That means microbes inside are breaking down the leaves and releasing energy that originally came from the sun. Boston is planning a unique composting center that would help with some of the city's energy needs. Like most major cities, Boston composts its yard waste in the open air. All those leaves from last fall wind up in drab, decaying mounds in a muddy clearing just south of downtown. 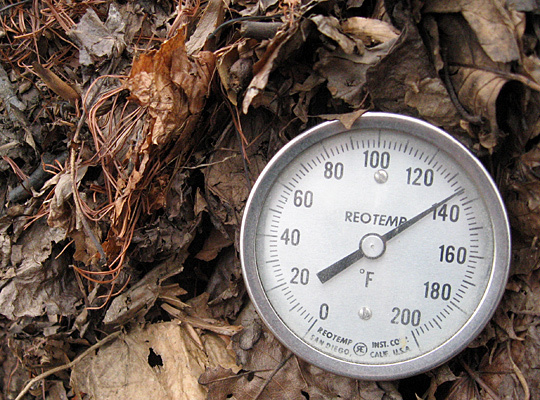 At the open-air site, Boston's Recycling Director Susan Cascino surveys the progress of the outdoor composting center by plunging a 3-foot-long thermometer into a pile of leaves that is as big as a house. The needle goes up past 130 degrees. That means microbes inside are breaking down the leaves and releasing energy that originally came from the sun. Right now both that heat and the byproduct methane are getting lost to the atmosphere. "It's a form of energy that we can capture," says Cascino. In addition to yard trimmings, the new indoor composting facility would take food scraps from restaurants and hospitals. "People think it's really cool that we can be more efficient with our wastes and put it back to productive use," says Boston's Environmental and Energy Services Chief Jim Hunt. "It's that old Yankee ingenuity here in New England and in the city of Boston." It will also require some savvy engineering. The technologies to do this have been around for years, but no U.S. city has ever put it all together on a large scale. Boston's proposed indoor compost center would employ about two dozen workers, including microbiologists and soil chemists — the sort of good-paying, so-called "green collar" jobs that cities are competing for nowadays. That's one reason why Boston Mayor Tom Menino is all for it. "We're really turning Beantown into Greentown," he says. If Boston actually pulls off this facility, it could turn other cities green with envy, says Nora Goldstein, editor of the composting magazine, BioCycle. She says most major cities truck their tons of yard waste many miles away, and they are getting killed by high gas prices. An urban facility would save Boston landfill, fuel and greenhouse costs. In addition, the city would make money by selling fertilizer and the extra power. Goldstein says the economics for such an indoor operation are finally coming together to make the investment pay off.